Andrés Duque (Caracas, Venezuela, 1972) is a Spanish filmmaker whose output (sixteen titles between 2004 and 2016) lies on the periphery of non-fiction with a strong documentary and essayistic component. 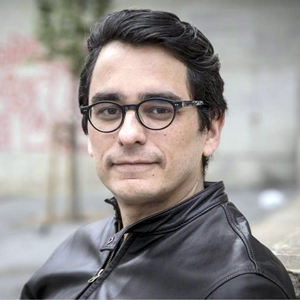 His first feature-length film – Color perro que huye (2011) – had its premiere at International Film Festival Rotterdam and went on to screen at a dozen other festivals and museum venues. In 2016-2017 alone it received awards at the Festival Internacional de Cinema d’Autor de Barcelona, Dokufest in Kosovo and the SEEYOUSOUND Film Festival in Turin (Italy). Internacional con monumento is the provisional title of a film about Karelia, a border region between Finland and Russia home to the Karelian people. Duque will construct a fragmented, essayistic narrative of historical moments in which real and fantastical elements of a culture collide. For Karelia – which has belonged in the past to Sweden, the Novgorod Republic, Finland and Russia – is a region of contrasts by virtue of its frontier dimension; the cradle of Finnish literature and a space where the memory of the wars and repression of last century is very much alive – indeed the Nazis’ Ahnenerbe project had it as the location of an idealized past that endorsed the superior origins of the German Aryan people.